They’re called Skinners. They function as a pair of shoes, but wearers can fold them up like socks for easy transport and storage. So far, they’ve raised nearly $100,000 (2.5 million CZK) on Kickstarter, nearly ten times the initial goal of $10,000, after a successful campaign on the local crowdfunding platform HitHit last year. Petr Procházka was inspired to create the unique footwear after finding that conventional shoes ate up too much room in his luggage when trying to pack light for a trip to Norway, writes Aktualne.cz. “Armed with ultra-light jackets, towels and space-saving dehydrated food, I watched the second half of my baggage taken up by spare shoes for ‘a rainy day’,” he said. The concept behind Skinners is simple. But the bottom is where the item truly comes alive: a unique sandal-like, ultra-flexible sole that is hand-crafted in the Czech Republic. 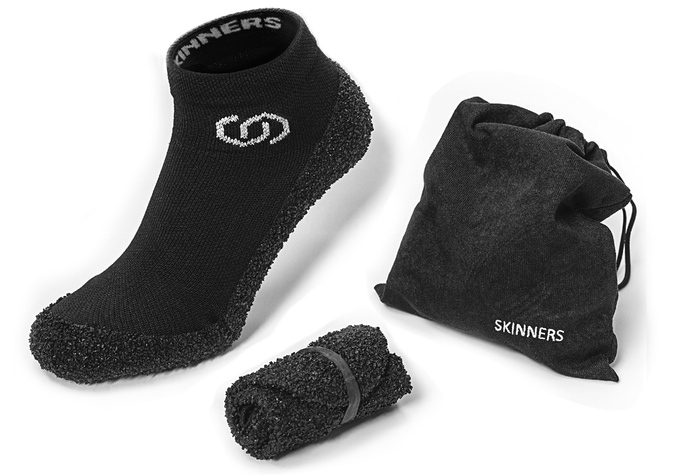 It provides the durability of a shoe, but allows Skinners to be folded up like socks for easy transport. You can read more about Skinners at www.skinners.cz or pre-order a pair of your own by contributing to the Kickstarter campaign. Kickstarter rewards will being shipping in August, while Skinners will hit the streets via online sales in October.